Always a must-have when it comes to unhurried cooking. It stores and distributes heat, even over a low flame. Ideal for grilling and grill plates. Before using for the first time, thoroughly wash the inside and outside of the pan using warm soapy water to remove the protective layer. Failure to remove this layer may damage the pan during use. We recommend drying with care to prevent excessive oxidation. Only use wooden, silicone or nylon utensils. Never cook foods dry. Always use oil, butter or grease on the whole surface. Avoid knocks or dropping. The enamel can become chipped and in that case, the product can rust. If the rims become rusty, the item is still safe to use, while if rust forms in the centre, cooking use is not recommended. Enamel can suffer from thermal shock: never suddenly cool an item or place it in the oven if this is already at a high temperature. In any case, never place the item directly on the bottom of the oven, but always on a shelf or rack. Always dry thoroughly immediately after washing. How do I clean off any food residues stuck to the grill pan? If the grill pan has any food residues stuck on its surface, leave it to cool and fill it with equal parts of warm water and bleach. Do not leave for longer than one hour. DO NOT try to scrape away any stains with scourers or aggressive cleaners, as this will damage the enamel permanently. Do I need to use oil on the cast iron grill pan? Is the enamel surface non stick? The enamel surface is not non stick. This means it should be lightly coated with oil. How do I care for the enamel on the cast iron grill pan? avoid overheating the grill or heating it too quickly (keep power at 50% and if using induction, 30%). Is my grill pan dishwasher safe? No. Heat and prolonged contact with water will damage the enamel. 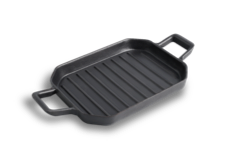 Can I use my cast iron grill pan on an induction cook top? set the cook top power to 30% max. lift the grill pan when moving it on ceramic cook tops. Sliding it could cause permanent damage to the grill pan and to the cook top. What is the best way to use my cast iron grill pan? For correct use, the grill pan should be gradually heated over a medium-low flame and given a fine coat of oil. Once heated, the grill pan will maintain its heat and distribute it evenly. This is why you won’t need to increase the cook top temperature during cooking. Is my grill pan oven safe? Is the cast iron grill pan nickel-free? No. There may be traces of nickel. This traps and stores heat evenly, giving you the pleasure of roasting and grilling at home. A constant link between food and heat sources. A must-have for perfectly crisp, golden fried results. Nichel FREEThe passe partout for perfect cooking. Pellegrino Artusi, the man and the book. “To be in the times and to last over time”.